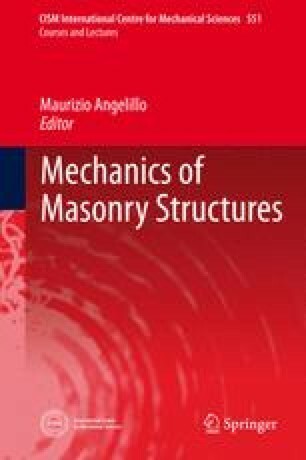 In this chapter, we shall first explicitly determine the solution to the constitutive equation of isotropic masonry-like materials (i.e., find the stress tensor T and the fracture strain E f corresponding to a prescribed strain tensor E, so as to satisfy relations (2.4)). The problem can be solved by observing that the stress in the isotropic case is coaxial not only with the fracture strain, but with the elastic strain as well. This enables representing all these tensors with respect to the same principal system and then expressing the constitutive equation as a function of their eigenvalues. In this way, (2.4) can be transformed into a linear complementarity problem (7), (27), (28) whose solution is unique because the tensor of the elastic constants has been assumed to be positive definite. As the solution to the constitutive equation depends on the number of principal stresses that vanish, in order to construct the stress function we need to consider a partition of the strain space into four different regions, each of which corresponds to different material behavior. We then calculate the derivative of the stress function with respect to the strain, as this will be used to construct the tangent stiffness matrix when dealing with numerical solution of the equilibrium problem. The derivative of the stress function turns out to be smooth in each region and its jump has no tangential component at the interfaces between the different regions.